House Of Cards star Kevin Spacey promised Frank Underwood has big plans as US president at the world premiere of the new series in London. 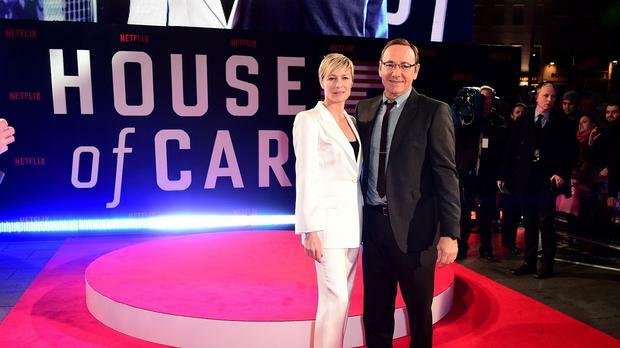 Spacey and Robin Wright, who play power hungry political couple Frank and Claire Underwood in the hit Netflix show, walked the red carpet at the Empire cinema in Leicester Square for the charity screening in association with The Old Vic theatre. The end of season two saw Frank finally achieve his goal of becoming President of the United States after years of planning and scheming to dethrone his predecessor. But Spacey made it clear his antihero character will not rest on his laurels in season three. He revealed: "I think that people who are driven by power - they want to accomplish things. "So it's not like now he's the president he has nothing else to do. "We all know how difficult it is to be a president and what kind of demands it has on the individual. "So I think that like anyone who has found themselves in that office, getting there is difficult, but once you're there, you want to accomplish things. So there's a lot to do." Wright stayed tight-lipped as to what kind of First Lady Claire will make, insisting she would be "ruthlessly punished" for giving away any spoilers. But she did admit she was excited by how popular the show has become. She said: "It's the new medium now. It's not surprising and I know they have other huge successes. "It's monumental what Netflix did. We started a new movement and it's the craze today. "It's mind boggling to me. And how great. How fantastic that you have a successful piece of material." House Of Cards is an adaptation of the BBC's mini-series of the same name, based on the novel by Michael Dobbs. All 13 episodes of the third season of House Of Cards will be available on Netflix from 8.01am tomorrow.